I thought I was crazy when I realized that I don't sleep well (or at all sometimes) unless I am sleeping next to my 2 year old. I had never heard of that before. Maybe it's more normal than I thought. How you manage the family bed now, since you have 6 kids in bed? Did you make your bed bigger or? We also love to co-sleep. Our daughter who is just turned 3 sleeps between us. Sometimes during the day she says; I'm going to sleep in my own bed, but a few minutes later she's out of it hihi. She wants to sleep in the daddy and mommy bed. Hey girl, sorry for my delay (just posted a blog post about how I have been MIA, LOL). You know for a while the older 2-3 were wanting to sleep in the office (which is just across the hall and we got a futon for in there so they could go there to sleep if they wanted, instead of having to go all the way up to their rooms upstairs). Only my oldest will sleep in there alone at times, the others will only sleep in there if they are with someone else. But lately they have wanted to be in the bed and that is fine with us. They know that if they are all in the bed it will be a bit crowded but they don't care. 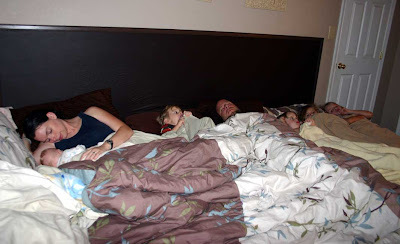 Typically it is like in the picture but since there is 1 extra kid one of them will sleep across the bottom of the bed, below the other 3 kids feet. It works for them and they enjoy it! I'll have to see if I can get a picture of it next time someone is over. If so I'll post it. Yes, your daughter will let you know when she is ready to move out. And if she is expressing a desire to sleep alone but not ready to move out of the room you can always try a mat on the floor or a toddler bed in your room (may give her the independence she wants without her having to be alone if she isn't ready for it yet). I too think about how nice it will be to have the bed back again, but I know that when I do I will miss cuddling up with little ones (like you said). Shoot I miss not being able to cuddle with the older ones because I have my 2 sides full with little ones, LOL!! So I just try to focus on now and enjoy things as they are so I will have no regrets in the future. Hi! I have always wanted family bed. But my first 2 children developed sleep habits that were completely incompatible with Mr getting any sleep at all. My first would bit stay asleep unless there was a nipped in her mouth, day or night. 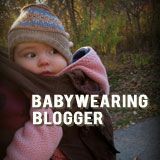 At 5 months old she was so crabby from lack of quality sleep... as was I! Even when she would nap it was only 30 mins here, 20 there, again- day or night. No allergies, no colic, lots and lots of breast milk. As far as I know, no reason for her not to sleep well. My son started out smoothly but got worse as he got older and would often wake at night to stock fingers up my nose, or cry inconsolable during the day because he was too tired to nap. I don't know how to develop better sleep for them while they are in my bed and being carried in a sling all day. Did you ever experience this with family bed sleeping? And yes, not every child is the same but we now have baby 3 who is 8 weeks old and already showing signs of interrupted sleep because he's being carried, or NOT carried. Or in bed right next to us but still will only settle with in-arms giggling and bouncing. This can't be normal- motherhood would never have survived through the generations!